Saltwater fly fishing is not just a game for the shallow water crowd. 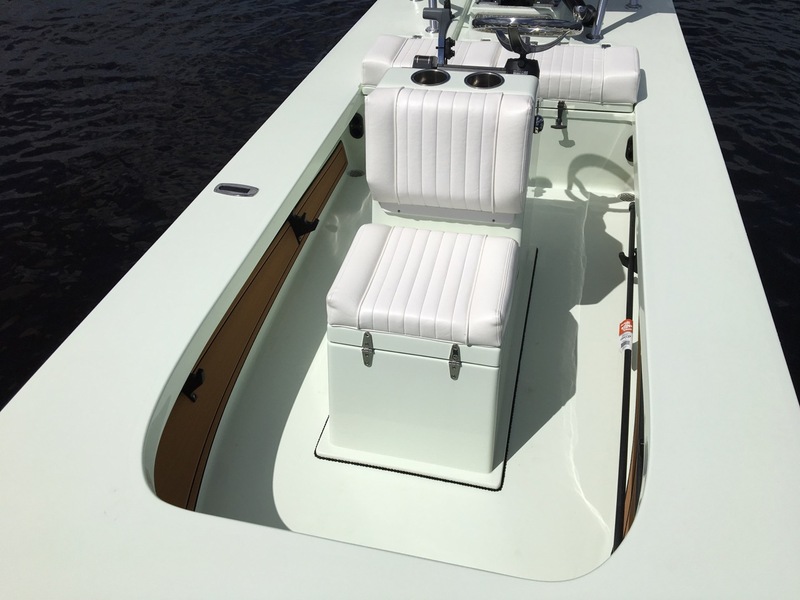 It’s true that the sport is mainly embraced by anglers with flats skiffs and kayaks here in SW Florida, but folks running the larger bay boats and center consoles should also give it a closer look, especially this time of year. December is usually the last month we have before the cold fronts and their northern winds start churning up Charlotte Harbor. Our water temps are currently still in the lower 70’s and plenty of species are happily feeding in the 3 to 10’ range. That makes this the perfect time to throw flies into the deeper drop offs from Burnt Store to Boca Grande. This is where some of the most aggressive fish can be found right now and they’ll usually eat anything that swims. Right before Thanksgiving, my anglers had several terrific late morning fly fishing trips in the Harbor just by following the birds. Diving terns and gulls are a sure sign of hungry predators and this time of year that can mean big schools of Spanish mackerel, jacks, and bluefish. We came across lots of feeding frenzies just north of Bokeelia and got effortless hookups with any pattern from my fly box. This was usually happening in about 6’ of water and we often had one or more bay boats tossing live bait with much heavier rods while floating next to my 18’ Beavertail flats skiff. If you’re one of the numerous owners of a 24 Pathfinder or similar hull and don’t have at least one fly rod under your gunnel, now is the time to fix that. When a half acre of ladyfish are blitzing glass minnows in the middle of Charlotte Harbor, nothing will make you smile more than sticking a few of these insane jumpers with a 7 or 8-weight outfit. Trust me, you’ll instantly discover a whole new appreciation for these “trash fish” when they’re ripping off a bunch of fly line from the deck and pulling your reel into the backing. Think of this as the ultimate way to catch cut bait. You really don’t need to spend that much money for a solid fly outfit to use in the deeper water. There are plenty of great rods out there in the $99 range that are more than capable of landing anything that swims inshore around here. You can pair that with an equally inexpensive, bar-stock aluminum reel that will easily stand up to the salt and you’re ready to fish. Just look for something with a lifetime warranty and you can’t go wrong. Flies are obviously an important part of your deeper water arsenal and this is the really easy part. Your entire fly box can be filled with nothing more than Clouser Minnows of different colors and sizes, and you’ll be in great shape. The standard green and white pattern tied on a #2 hook will be eaten by just about every predator in Florida. They’re not too expensive to buy, either locally or online, and they’re very easy to tie on your own. So the next time you’re out on the 24’ bay boat, toss a weighted Clouser Minnow into 6’ of water anywhere in Charlotte Harbor and chances are you’ll pull something off the bottom. It might be an unwanted catfish or underrated ladyfish, but you also might bring in a hard pulling jack crevalle or a great tasting pompano from the same spot. Best of all, you’ll get some experience with a proven type of tackle that will be invaluable to your saltwater skills. Good luck out there. If you're looking for a new toy from Santa stop by the Old Fish House Marina on Matlacha tomorrow from 10AM to 4PM and check out the latest Beavertail Skiffs. They'll have a pair of all new Mosquitoes, as well as a Micro, Strike and Vengeance all in the water for test rides. You can also meet with company owners Will and Liz to talk options and pricing. This is always a very busy event but the Marina is an excellent place to hang out, have lunch and listen to some live music in between boat rides. Hope to see you there. The monthly Pine Island Fly Fishing Club meeting will happen on Monday, Nov. 28th at the Matlacha Community Park Civic Center at 6:30 PM. Parking is free and we only ask a $3 donation to cover the cost of renting the hall. This is always a great time with lots of local info and a chance to meet up with other SW Florida anglers. Hope to see you there. Stop by the Ft. Myers Boat today through Sunday and you can check out hundreds of different boats from kayaks to million dollar yachts. Two of the newest Beavertail skiffs will be there, a Vengeance and Mosquito, will also be on display and offered for sale at a special show weekend price. You can also meet Capt. Blair Wiggins from the Addictive Fishing TV show at the Beavertail booth on Saturday from 10 to 6. This is always a great show and the weather is fantastic this weekend. Hope to see you there. Beavertail Micro on the Cuban Flats. Photo by Alex Suescun. 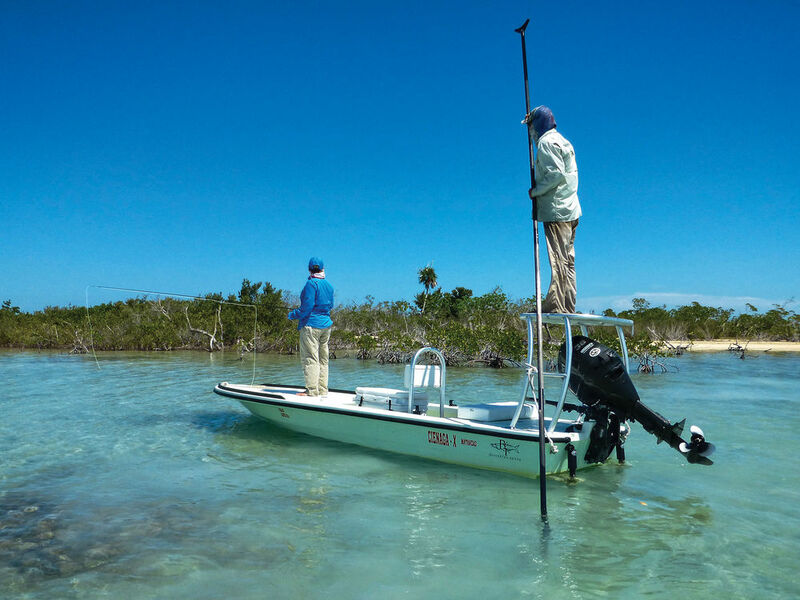 This month's issue of Saltwater Sportsman magazine features a great article about fishing the famous Zapata flats with Enridan Outfitters in Cuba. I met the managers of this lodge last month at the Beavertail Skiffs tournament and they were great people who were really excited about their waters and introducing it to the fly fishing public. Click here to read up on this spot and stay tuned for details about a possible hosted trip next year. November means one thing to me as a fishing guide in SW Florida: negative low tides. Seeing that little minus symbol on the tide charts when the lows happen just after sunrise and just before sunset is almost as good as finding presents under the tree on Christmas morning. These are some of the best conditions to chase tailing redfish and for die hard skinny water anglers this is as good as it gets. I’ve been guiding out of Beavertail Skiffs for the last 10 years and have been more than thrilled with all of the boats that come out of their Bradenton, FL shop. My current skiff is a 2012 BT3 powered by its second Yamaha F70 outboard. It’s an almost perfect combination of shallow, stable, and silent all while giving my passengers a bone dry ride. Those features were basically impossible to find in an 18 foot poling skiff when I started guiding 20 years ago. Last month, Beavertail introduced their newest 2017 model, also an 18 footer, called the Mosquito. 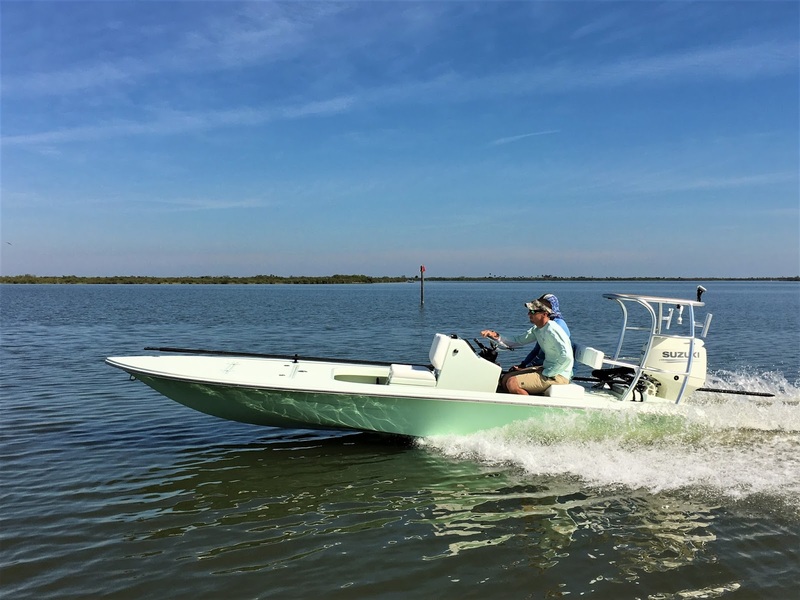 This latest boat is aimed right at the serious fly anglers who want to get further back into the mangroves than everyone else. With a beam of 70 inches and a hull weighing just 540lbs, this is a very skinny running skiff. With two anglers and a full tank of gas, I’ve poled it effortlessly in water that’s probably too shallow for big reds. The Mosquito is also dead silent with no wave slapping noise anywhere on the hull to spook tailing fish. Power choices run from 30 to 70hp but the motor that impressed me the most on the Mosquito was the new Suzuki 60 four-stroke. With the right prop this will be a 35mph boat wide open and cruise around 28mph. I’ve owned four-strokes for the last 5 years and love their fuel economy and quiet running. I can actually have a normal conversation with my passengers while the engine is turning just a few feet behind us. I always had to shout on my older boats with their louder two-stroke outboards. 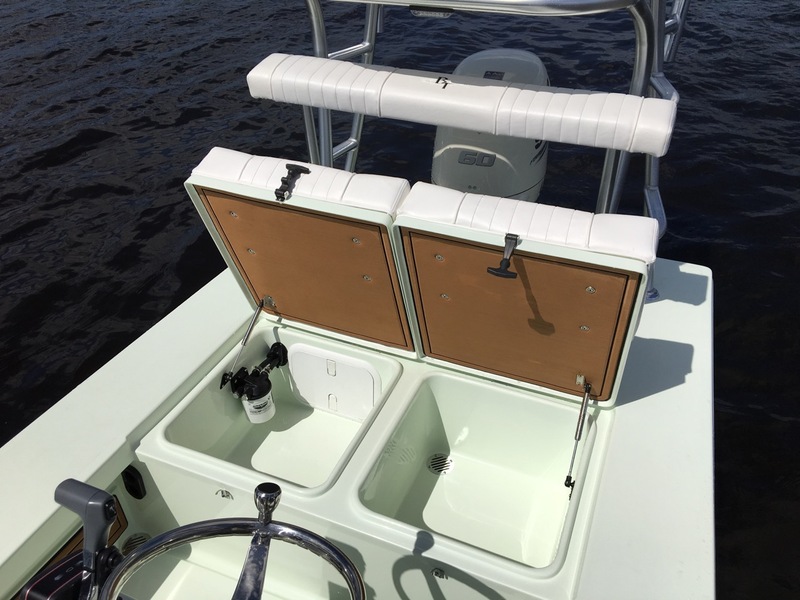 Beavertail will configure the Mosquito with tiller, side or center console steering. The brave, young guys who want to vanish into the Everglades will go for the tiller rig since it’s possible to get a 5 inch draft with that option. I’m looking very hard at the center console with its thick padded forward jump seat/cooler combo. That will allow my anglers (and occasionally me) to lean back with our feet up and enjoy the ride. Hydraulic steering is standard with the center console and that makes it even more effortless to drive. The best part owing any Beavertail is how dry they all run. In my current BT3, with its 82 inch beam, it’s honestly difficult to get wet even in very choppy conditions that would have drenched us in some of my older skiffs. The Mosquito is a foot narrower and while it’s not designed as a pure open water machine, I wouldn’t hesitate to run it across Charlotte Harbor on a 15 knot day. This is a great time to be in the market for a new boat, especially ultra-shallow poling skiffs. You have a lot of choices out there and at least a dozen more manufactures are in the mix than there were 20 years ago. The BT Mosquito has some serious competition, most notable are the excellent Maverick HPX17 and the Hells Bay Waterman, and almost all of the manufacturers are an easy drive from our area. Best of all, Boat Show Season is starting and the 44th annual Ft. Myers show kicks off at the Harborside Event Center on Nov. 17th. This should be your first stop if a new fishing rig is on your shopping list. You’ll be able to meet several of these builders in person and compare their products side by side. Hope to see you there. 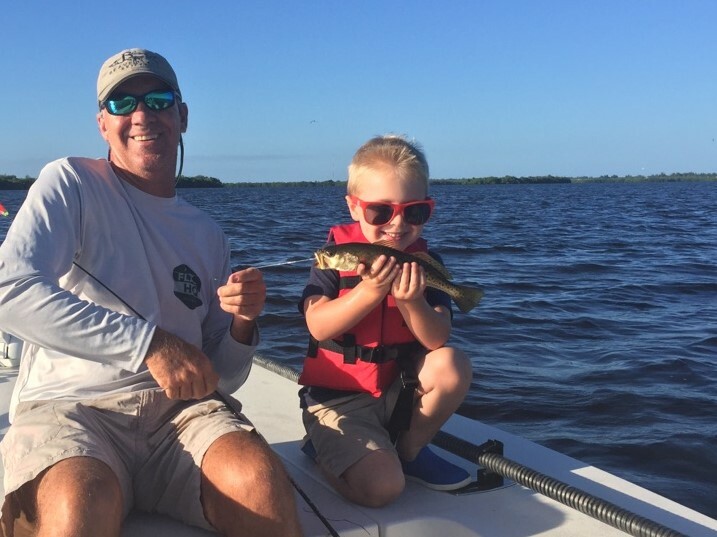 I recently had my best day on the water so far this month fishing with 4 year-old Emmett Walker and his dad Kyle. Emmett showed us how it's done by landing the Inshore Slam of a redfish, snook, and a lot of trout. The best part of the trip was watching him bring in several of these fish on his 4' Ugly Stick and Zebco push-button reel. I have to admit that I borrowed the rod from him for a while and landed a few trout on it myself. It's more fun than you can imagine landing saltwater gamefish on a kid's bluegill gear. Great job, Emmett. Can't wait to get you a tarpon next summer. If you’re a full time resident angler, you already know what a valuable resource the Nautical Mile has become. Chances are you pick up a copy from your favorite tackle shop at the beginning of each month and read it cover to cover. I know I do. And chances are you’ve also met publisher Jim Griffiths or heard him speak at one of the numerous fishing clubs and events he attends or sponsors throughout the year all over SW Florida. If you haven’t, you will. The guy is tireless and shows up everywhere when the topic of our local water is involved. If you’re new to the area or just here on vacation, you’ll definitely find the Nautical Mile to be more useful than any other publication on the stands. Most of the articles contain a lot of How-to information with a handful of fish stories dropped here and there. I’m strictly an inshore flats guide, which is a very accessible type of fishing for just about anyone, so I tailor my columns toward the small boat owner with a big emphasis on fly fishing. And Pine Island is definitely one of the best areas in all of Florida to do this. So what can you expect from our waters in October? Just about everything. This is easily one of the best months to fish anywhere in the state with the temperatures leveling off from our summer highs and a good bite happening any time of the day as long as the tide is moving. 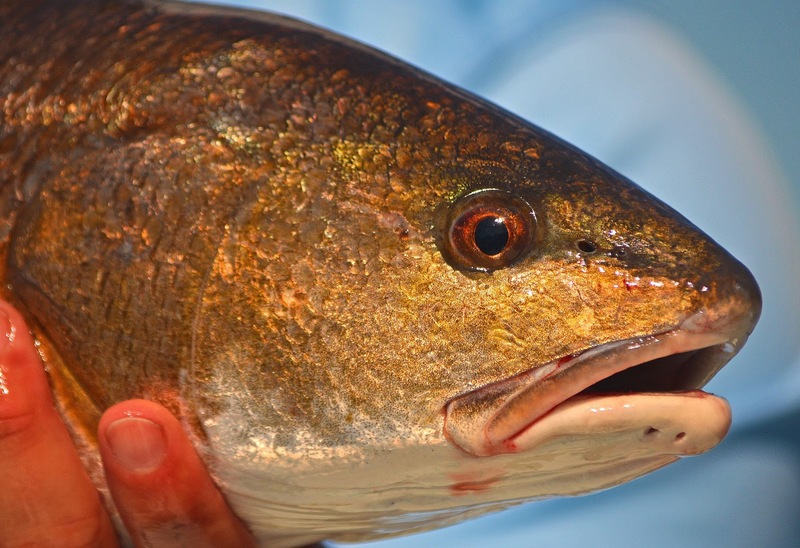 The redfish have been schooling up since early September and they can often be found in very thick schools on the flats in northern Pine Island Sound. They will literally turn the water orange when the sun hits their backs and often eat anything in their path. The huge flats inside the Burnt Store Bar are a well know area for these schools but it’s best to look for them on the weekdays when there’s less boat traffic running back and forth from the marina. Snook have been back in season for a month and this is a fish you want to get after right at sunrise. The mangrove shoreline of Matlacha Pass, just north and south of the drawbridge, has held a nice amount of bigger snook, including a few of the elusive slot-legal ones. I recently had an angler lose a real monster on a fly rod from under the dock at Bert’s Bar. It hit a white 2/0 Deceiver and we had it on long enough to realize that it was at least a 40 incher. The 15# tippet we were using might as well have been sewing thread when it dove back under the pilings. At least the bar was closed that early and no one was watching. Painful. Of course trout on almost every grass flat between 2 and 4 feet of water and won’t be going anywhere for a while. And as an added bonus, there are still more than a few schools of tarpon out there. This in another fish you want to target at daybreak, especially when the water is perfectly still. Look for them rolling off the Burnt Store Bar just as the sun is poking above the horizon. So that’s October in a nutshell. Best of luck out there and thanks again Jim Griffiths for letting me write for your paper these last few years.